Find out how an artist works with a client to create a custom, cartoon logo to represent a business. 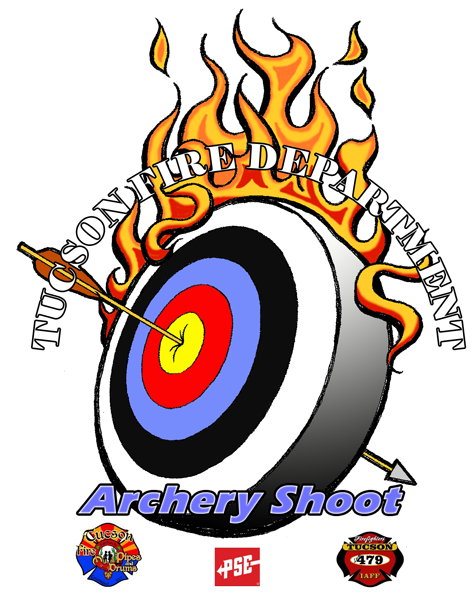 A marketing executive contacted me with regards to an upcoming Archery Shoot with the Tucson Fire Pipes and Drums band and Precision Shooting Equipment (PSE). She inquired, whether or not, I would be interested in volunteering some time to create a logo to represent this event. I gladly accepted her invitation and the phone and email conversation commenced. Her first thought was that most of these men & women are pretty fascinated by flames, although she was not sure if that’s too cliché’. It would be an outdoor shoot at the PSE facility. I drew a pencil sketch of a flaming archery target with arrow through the center of the bulls eye. Then I added the copy to the colored sketch and attached it to an email directed to her. She passed the rough color digital image on to the guys, in the band, to get some feedback.